Have you been eating lots of holiday sweets? I know I've eaten my fair share of cookies and candy recently and I really wanted to make something healthy. This recipe is from Drizzle and Drip, another mouth-watering and delicious looking blog. 1. 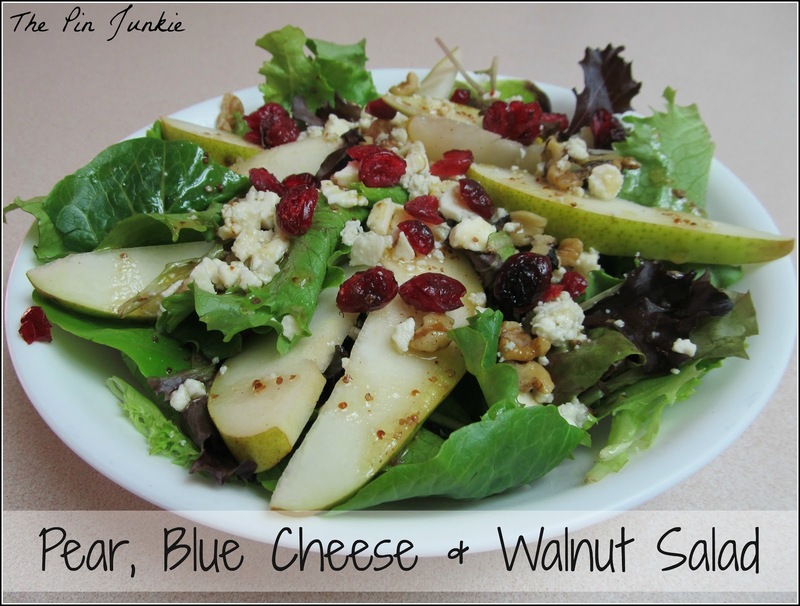 Mix arugula, sliced pears, walnuts, and blue cheese. 2. For dressing, mix oil, red wine vinegar, syrup, mustard, and salt. Mix well. Pour over salad. I thought the salad looked a little plain, so I added some dried cranberries that I had left over from the cookies I made earlier this week. Easy to make and delicious. Enjoy! This looks amazing! I am so sick of all the eating from Christmas and this looks refreshing! Your salad looks wonderful. I don't think I would have come up with this combo of ingredients myself. I’m co-hosting with Katherine this week at Thursday Favorite Things and hope you will stop by for a visit. Wishing you all the best in 2013. This looks delicious! I love craisins and salad! and I love your blog title!! (happy pinners unite ; )!Hopping over from Share It Saturday! Have a great (healthy!) week-end! That looks delicious! Thanks for sharing the recipe. Happy Holidays! 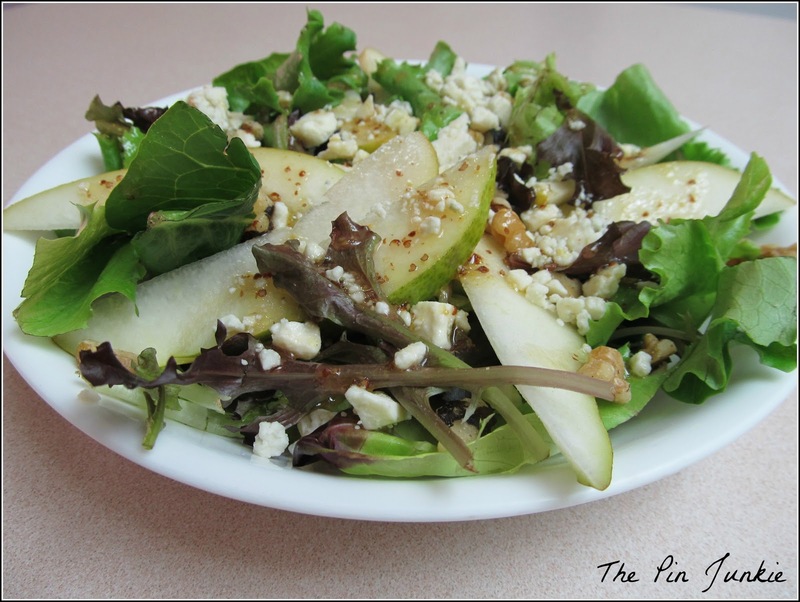 We have a similar recipe and we make this salad for holiday dinner. Yummy! I pinned this! Finding this recipe is always on my to do list but I hate searching endlessly through recipes.com and those types of sites to find the right one (too many options!)... thanks for sharing! I can't wait to make it! I love these kinds of salads. I will have to try making this one. Looks amazing! Thank you for linking up with the Clever Chicks this week; I hope you’ll join us again! Just found your blog through the YOLO linkup - excited to follow along via GFC and read more!! Nummy! It looks great, can't wait to try. Thanks for sharing. We received several Harry & David pears for Christmas and I've been looking for a yummy recipe to try. This one looks like one I want to try. That looks divine and I will be pinning it myself! This looks delicious. I love salads, especially ones as pretty as this. Thanks for sharing on "I Gotta Try That" I hope you have a very Happy New Year! I love a great salad and made one similar to this for our Christmas Day dinner guest. Love the addition of the syrup to the dressing....must try. Happy happy New Year. Now that salad does look scrummy!! That looks delicious! Thank you so much for stopping by. All my best wishes for a wonderful 2013! Thanks so much for featuring my salad! This salad looks so, so yummy. Wish I had one right now! A few years ago I enjoyed a superb meal at a high-end restaurant and a salad much like this was part of it. It was my favorite part. Pinned this delicious photo! Had this for lunch today. Super Yummy!!!! Thanks for sharing. So glad you gave it a try and enjoyed it! This look delicious! I have been adding craisins to my salads...they satisfy the sweet tooth and yes make salads look even more inviting! Thank you for sharing the recipe for your salad dressing, I've been looking for new ones...I've started sharing salad creations on my blog and would love for you to join in and share this post!! Thanks for the feature! It's very sweet of you!